Inspired by the great master Dominique Ingres Erhard Beitz has created a very interesting print. 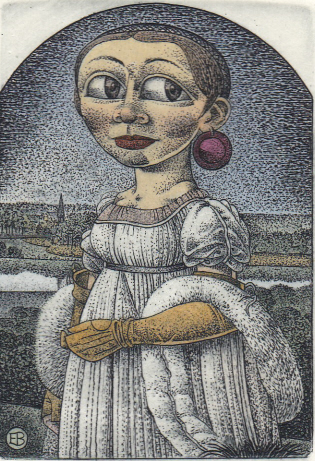 This print is a good example of the fantastic detailed prints Erhard Beitz is a master to produce. The print is beautifully coloured. This is a hand coloured etching in only 10 copies. Picture area: 5,5*8 cm (2,2*3,1 inch). Paper size: 15,5*20,5 cm (6,1*8,1 inch) (not shown in full on the screen). The print is signed and numbered by the artist, and the edition is 10.